HOW TO TRAIN YOUR DRAGON: THE HIDDEN WORLD is the third and final installment of a series that has been going for almost a decade. The original film, based on the books by Cressida Cowell, opened in 2010. Rather than rushing through sequels, DreamWorks Animation took time developing each film. The result? HOW TO TRAIN YOUR DRAGON is one of the best animated series ever made. Tickets are on sale now for THE HIDDEN WORLD, which flies into theatres on February 22. So, we wanted to take a look back at a decade of HOW TO TRAIN YOUR DRAGON. When HOW TO TRAIN YOUR DRAGON opened in 2010, not even Cressida Cowell could have imagined how successful it would be. It grossed almost $500 million worldwide, topping the American and Canadian box offices. Naturally, DreamWorks wasted no time turning the film into a franchise, with both sequels and a spinoff TV series. But what makes HOW TO TRAIN YOUR DRAGON such a tremendous hit? The story begins back in 2003, when Cowell, a British author, published the first in a series of children’s novels. Cowell grew up on a remote, otherwise uninhabited island off the coast of Scotland, without roads, houses or electricity. There, her young imagination ran wild; she conjured up wonderfully creative stories filled with Viking warriors and dragon species. Years later, as a recognized children’s author, she tapped into those childhood stories to create a beautiful world that captivated readers. The books caught the eye of DreamWorks producer Bonnie Arnold, fresh from the success of OVER THE HEDGE. This was a project Arnold could believe in. As the first film was developed, the scripts were faithful to Cowell’s novels, which skewed toward a young audience. Then, halfway through production, DreamWorks hired Chris Sanders and Dean DeBlois (MULAN, LILO & STITCH) as co-directors. The pair looked toward a new direction. As Arnold told Wild About Movies, “I think our breakthrough was crafting an origin story.” Cowell’s books imagined a world where Vikings and dragons already lived together. The first HOW TO TRAIN YOUR DRAGON film imagined how that would come about in the first place. The first film focused on six different species of dragons. To bring them to life, the animation team conducted extensive research on flight. The results captivated the directors. The dragons were designed with tremendous care, with concept artists deliberately avoiding all of the cliched dragons of myth and legend. The concept for Toothless was particularly innovative, combining various dragon traits with a black panther-inspired design. The key to any animated movie lies in its characters. It’s not hard to see traces of Cressida Cowell in Hiccup, a gangly youth who just doesn’t quite fit in. As Sanders explained, “The thing about Hiccup that we love is that he wants to be a Viking. 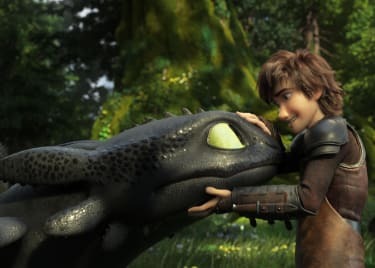 It’s not like he woke up one day and said, ‘I wish I weren’t one of these guys.’ On the contrary, he desperately wants to be one of them.” Yet HOW TO TRAIN YOUR DRAGON acknowledges that Hiccup is not one of them — he’s different and unique, and his perspective has the power to transform his entire world. Astrid was created to contrast with Hiccup. She essentially represents the ideal Viking warrior woman. She knows she’s going to inherit the war with the dragons and is determined to be ready for that responsibility. She’s not mean or ruthless; rather, she’s utterly, relentlessly dedicated. If Hiccup can turn her world upside down with the idea of peace with dragons, he can win over anyone. The success of the first film made a sequel a certainty, and DreamWorks decided to use the second movie as an opportunity to innovate. 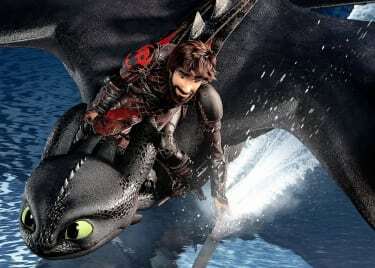 HOW TO TRAIN YOUR DRAGON 2 was made using experimental animation technology created by DreamWorks in partnership with Hewlett-Packard. In particular, animators used new programs designed to improve facial rendering. As DeBlois told Variety, “We ended up with so much subtlety, in facial animation, the sense of fat, jiggle, loose skin, the sensation of skin moving over muscle instead of masses moving together.” This, accompanied with strong storytelling, made the sequel another hit. These characters grow and change, and that’s a key to the success of the series. The films are the story of Hiccup’s coming of age. He finds his identity and becomes the man he was always destined to be. That’s why there’s an actual passage of time. Five years pass between the first and second films and another five between the second and the third. The plots age up a little with each installment, too, with the assumption that the viewers will have grown older as well. In this sense, the franchise is similar to J.K. Rowling’s “Harry Potter” books, where the passage of time is central to the story. Sanders and DeBlois came up with a complete story. 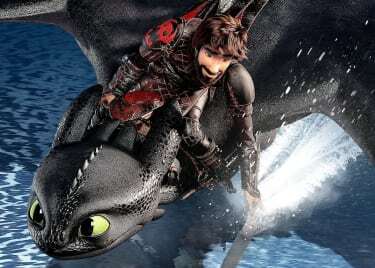 HOW TO TRAIN YOUR DRAGON is the origin; the sequel expands the world; and the third film brings it all to a satisfying conclusion. After all, as they pointed out, when you’re dealing with dragons, you ultimately have to answer one question: Where did they go? We’ll be sad to see the series end, but every generation needs its own Hiccup — someone who can bridge the gulf between implacable foes, even between Vikings and dragons, and build a lasting peace. This phenomenal franchise could inspire children who’ve grown up to love Toothless and his dragon kin. 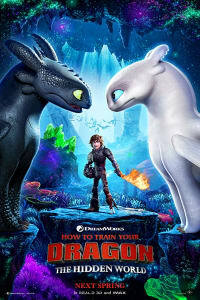 Get your tickets for HOW TO TRAIN YOUR DRAGON: THE HIDDEN WORLD at AMC today!